Casa de los Venados is private home and national cultural tourism asset as it has the largest museum quality collection of Mexican folk art in private hands." We have 3,000+ pieces on our collection. We are not a business, but simply a private house museum which is open to the public every day at 10 AM for tours in both English and Spanish. Watch our before and now Video! Take a look at what Casa de los Venados was when we first got it and to what we have converted to after ten years with a lot of work and passion. 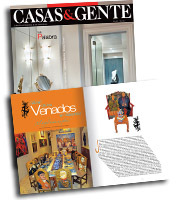 Casas & Gente is national upscale interiors and life style magazine with a high income readership is most like Town and Country magazine in the USA. The World's oldest hotel inside an archaeological park, built in 1923 by the Barbachano family, who own and operate it to this day. The house is a major national cultural tourism site because it has the largest collection of museum quality Mexican folk art in private hands.